Singapore rarely fails to impress with it’s novel attractions but this new public feature is a disappointment to both tourists and locals – especially the botanist or the nature lover. Looking less of an eco-park and more like a Dr. Seuss landscape, Marina Bay’s new Gardens By The Bay only caters to those who enjoy fast food, dull restaurant chains and wide concrete avenues. A strong tradition of botanical gardens, manicured lawns and conservatories of exotic flora was exported to the British colonies. Singapore did more than just inherit the English love of public gardens, they went further and developed their tiny island home into what the National Parks Board call a “city in a garden”. 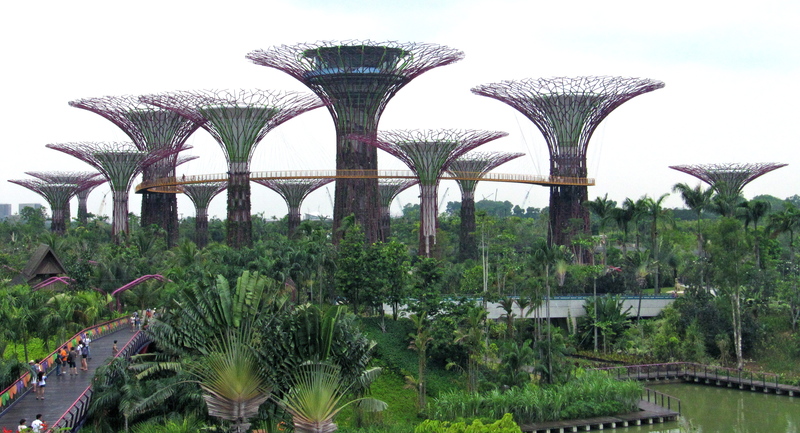 Singapore has over 55 parks and gardens. Many locals note that the majority of the national budget goes towards defence and parks. The parks and gardens are beautifully kept – indeed a welcome oasis in a city state. The most recent addition to Singapore’s collection of green space is the Gardens By The Bay, which has been marketed to the world as an eco-friendly “super park”. The fact is that there was no ecological consideration involved in planning this attraction: This SGD$ 1 billion garden is built on reclaimed land. Anything in the park that is not concrete is painted in playground hues of magenta and yellow. The statues are uninspiring ones of bulls, dragonflies, wild cats and abstract humanoids. The park is illuminated at night by giant, artificial trees of reinforced concrete known as “supertrees” adding to Singapore’s increasing photo pollution problem. What is a supertree? These veined, metal and concrete eyesores are essentially vertical plant holders which are lit by solar power, similar to Babylon’s hanging gardens only in suspension and otherwise just a building with a few potted plants inserted into the sides. The supertrees are to be an example for all cities which have limited space for greenery. A giant, expensive plant stacker. In most cities in the world, people would just plants some trees. But what could be more super than a real tree? I have another ethical dilemma in visiting Gardens By The Bay: I can’t really enjoy myself in a place that I’ve seen built by exploited foreign workers, but that’s another story. The dining options are many as a host of fast food chains have been invited to open outlets in the park, most of them being quite expensive. The current fine dining option is Pollen, serving mediterranean cuisine under the supervision of the all-important celebrity chef. It seems that the cost of dining at Gardens By The Bay, or even visiting the park, is quite expensive for the average Singaporean who can visit the exquisite Singapore Botanical Gardens for free and the National Orchid Gardens within charge only $5 admission. In contrast, the Gardens by the Bay is outrageous: for one adult and one child to have full access to the park’s conservatories waterfall – the stainless steel drain – and walkways costs $40. The cost for non-residents is higher still. With all this revenue from restaurants, venue spaces and admission we are still encouraged to donate to the cause and volunteer to help keep Singapore beautiful. An environmentalist’s vision of a new garden at Marina Bay would involve water lilies and mangroves rather than concrete for the swampy coastline. Such plants would encourage wildlife, protect coastal erosion, and would save the National Parks Board a fortune. How could they destroy Bukit Brown? It’s such a shame that some of the Gardens by the Bay’s budget did not go towards preserving Singapore’s unique jungle sanctuary of Bukit Brown: the site of a historic Chinese cemetery; home to kingfishers, pangolins and monkeys. Want to keep Singapore beautiful? Less concrete, less consumerism, more plants. I could have saved this country a billion dollars. Currently I’m living in Singapore and haven’t been there yet. After reading your post, it’s less appealing to go there. Haha! I hope I have saved you the time and money – I recommend Bukit Brown instead – it’s amazing, up the road from MacRitchie Reservoir. It’s free, it looks like an ancient ruin… and there’s animals! Don’t listen to hear say. Go and see for yourself and make your own conclusion. I had a wonderful time cycling there and I done find it concrete at all..
It’s true that they have some beautiful species of plants there but they grow on thousands of tonnes of cement. It’s a crime against the planet. Watching them built that monstrosity broke my heart, and Mother Nature’s too! Very enlightening post. You’d think that such a tiny country would value and protect every acre it has (does it seem like most eco-friendly countries tend to be small?). I haven’t been to Gardens by the Bay (or Singapore), but I’ve seen it splashed across the pages of many top-end travel magazines. Maybe they want people to have a fairytale image of the place before they arrive so they don’t even notice the underlying problems? My friend who is currently in Singapore posted some awesome pics of the place at night! But I must admit, without the lights, the whole thing looks a bit drab! Well, I think it’s pretty and clean in general but the new areas like this – very drab indeed! Chinatown, Geylang and Tiong Bahru have nice buildings.Go take a look, I bet you will like them! Hi Terry, I was in Bukit Brown with a few activists, demonstrating against the construction of an expressway there. You are right, it’s a very non-typical-Singapore place. Perfect for people longing for untamed nature. The downside is that – of course – the place is not that easy to reach and get away from: I cycled there from my Serangoon North home but the roads there are quite dangerous for cyclists. I just wanted to mention a few other opportunities to get away from the concrete jungle: Wessex Estate/Portsdown Road. There, try “Colbar” and enjoy their vast selection of ciders and beers and local food. There is also a great (expensive) Italian resto in a black and white house (Pietrasanta) and a great (expensive) French patisserie (Laurent Bernard). I also like Farrer Park (the “Training Shed” is a place where they do BBQ and live music on Sundays) and Kranji Farms (http://www.kranjicountryside.com/). YOUR MUM IS AN AN ECO DISASTER. Wasted another billion dollar. I so agree with you. Thank you, you are able to overlook the superficial! visited Gardens By The Bay several times since its opening. The gardens does a mighty fine job in attracting the average joe like myself. I have several friends who became members, they visited the gardens with their friends and family members. Their visit to the gardens led them and i to appreciate nature more. Lets not forget the endless busloads of young school kids who visited the gardens and their interest spiked. The purist have their own gardens. It is extremely elitist to pour scorn on a project that widens and captures the interest of the average man in the street or kid who may develop an interest in plants because of their visit to this ‘eco disaster’. While some people may be happy with the end product they fact that $1 billion dollars was spent on one tacky theme park garden (which costs a fortune to visit in its entirety) instead of investing in saving some of Singapore’s natural habitat is disgusting. What a waste of cement, time and MONEY. GBTB is catered for Urban dwellers who do not mind some nature but do not want to endure the heat, mud and mosquitoes. Aiya. Dun like dun visit. Like how many people do not buy into whole ‘holistic clean food whatever’ movement. You dont see most people using the word ‘yucks’. You think the masses will walk into the wetlands? Why dont you stay in the jungle instead? I try to stay in the jungle but they keep knocking through to build highways. Bye bye to all of our beautiful jungle friends like the pangolin. Aiya…dun 2 stay in jungle just say so lah. There are so many areas with jungles in singapore u know, even behine taka got jungle, jurong got jungle, clementi got jungle, bukit batok lots of jungle..you still need your aircon, comfy bed amd concrete house say so lah. You this kind of people are like that. Local slang is called NATO. Not everyone can afford to makan your so called natural organic holistic food which really taste awful…but i dont want to call it YUCKS. Calm down, Gerald. Organic food is the best in the world because it’s real and natural – give it another try! You are an idealist and purist living in an imperfect world. Admirable but futile. Adapt or die. Perhaps, Johnny – it’s never perfect as you say. Adapting doesn’t mean we have to accept that which is wrong. Also like to add that Gardens by the Bay wasn’t built for people like you, who appreciate nature for what it is. 90% of people who visit the gardens will never step foot into a mangrove or pristine jungle. If even just a fraction of these people leave the gardens with a greater appreciation or curiosity for plants and nature, I’d say it is a net gain. What a shame, living in Singapore and not seeing the beautiful nature it has to offer. I agree, I hope that at least GBTB arouses an interest in flora and fauna amongst people. An interesting viewpoint. However, in my heart it serves a very different purpose. Instead of an eco-garden centred around appreciating the greenery and eco-friendly ideals, it is to a regular Singaporean like me: a chill-out spot, a scenic hotspot, and a wonderful event space. Just like the Botanical Gardens, the Gardens By the Bay serves as a great place to visit with friends and family. The lush greenery(no one can dispute that there are plenty of plants around), fresh and relaxing atmosphere makes it a great place to have a relaxing afternoon adventures or evening walk. To add on to that, the various zones contain enchanting sights from the vibrant plants to the elegant structures interwoven within the gardens. Take for example the Flower Dome when it is all decorated now for Christmas. Christmas themed sculptures and dazzling light fixtures (the flower dome itself looks amazing at night) are a feast for the eyes.It is an amazing sight that brings smiles of joy all around, truly a scenic icon. And all these make it an amazing event space. From regular concerts that I see every couple of weeks, to larger events such as the Christmas Wonderland where the area is transformed into a place full of Christmassy events such as a Christmas market, and an ice rink. The great atmosphere and beauty of the Gardens By the Bay make it such a perfect event location. Now, I am not here to doubt that it is an “eco-disaster”. Rather, I feel strongly for the Gardens By the Bay to have a different purpose for many average Singaporeans. To us, the eco-park aspect of it is not as important as it being a great place to go to. And I cast further doubt into your various accusations against it. Was the intention really to further the awareness of eco-friendly ideals or to preserve nature in its raw form for Singaporeans? I sincerely doubt so. In my mind, the Gardens by the Bay has been a smashing success. Shallow as my definition of success may seem to be next to your environmentalist view, I feel it is more that enough for an “Average Joe” Singaporean. Had been to flower dome a few times. This 2015 Christmas deco was much reduced as compared to 2014. Lights were not lighted up on 4 December and whole place was very dim. Previous visits had been pleasant. Though the decorations or plants may seem artificial to some, but it allows many people, including the seniors to enjoy a lovely visit in a cooling place. I visit it for the atmosphere and the decorations. I probably would visit it again, provided the flower dome is up to my expectations. Those gardens outside, i foresee with age, they would become more natural in the future. This isn’t about preferences: The problem is that from an environmental point of view, Gardens By The Bay could have been made a usable swampland park with mangroves and lilies as opposed the the $1 billion concrete landfill monstrosity that it is, Singapore has enough of that already. The Supertrees add to the photopollution problem in Singapore and the park simply isn’t good for the earth. That’s why I don’t like it, I really have nothing against the waterfalls and spice garden there. In addition to this, some of the precious natural terrain of Singapore has been destroyed (along with its wildlife) while GBTB was given the go-ahead I do not live in a jungle hut, nor do I wish to. I just like to know that native habitats still exist and can co-exist with humans. You sound like a disgruntled former employee. You might want to look up the supertrees. Read a little more, talk a little less, you know? They actually perform a vital function of the park. Did you know that they are vents for the power plant you can’t see beneath the park? Probably not. That would require listening to others instead of just listening to yourself talk. That’s why I hate these fake trees. They just add to Singapore’s photopollution problem. Put in real trees and watch the Eco system thrive. Ask yourself why is there a POWER PLANT under a garden? It’s not in the interests of the environment. Don’t assume that because people disagree with you that they have not been presented with the facts. I had a tour of the GBTB days after it was completed and have returned since. Still unimpressed with the waste of money and resources. And supertrees are bloody ugly – everyone gets their opinion. But if you put real Trees then the park has to run on power form power plants that use fossil fuels that POLLUTE THE AIR and contributes to GLOBAL WARMING. So the super trees are much better. I’m sorry, I don’t quite understand. But nothing is better than real trees – fact. I like your point of view. But, there are many view points to note. Imagine taking a trip to disney land – many children and families are buzzing with excitable joy, families spending their money to the exchange of momentary hedonistic happiness. End of the day, they all go back home feeling happy and entertained even they know everything in disney land is man-made and fake. Singapore is a garden city positioned as a tiny red dot on the world map, it is economical driven and capitalistic; and the people are geared towards economical success with the ideals of attaining certain standards of comfort but not educated in the areas of energy conservation, recycling, and their roles in carbon foot prints reduction. Children are often chauffeured to schools; air-conditioning are mandatory appliances for comfort; pay cheques are scurried to pay mortgage debts; leaving very little headspace to think about such environmental issues. Case in point, many lack the mental capacity or adaptive intelligence to understand your point of view. When you write an article of such, naysayers tend to criticise rather than listen (as how they will always do with other articles too, first world problem coping mechanism – burying their faces behind their smart phones, displacing their stress on others with an imaginary self-righteous indignation but without the acute awareness to understand the complexity of the bigger issues of the world, apart from their minute little lives.) Hmmm…anyway back to your article, Singapore is indeed a concrete jungle, and we attract tourism with the mass collectiveness of fake and aesthetic structures/ shopping malls and food chains. I mean, everyone are happy living in their bubbles. We are just a small island, and we can only go round and round in circles. I believe you have seen dogs chasing their own tails? Metaphorical point of course. Hence, Singapore is just a Mickey mouse land for the adults. Everything is fake. Well, like I said earlier, you have many viewpoints to view. Case in point again. Aiyo…u do not use smart phones? Please lah..if you DO travel, please look around you…even in less developed areas in thailand, cambodia, eastern europe people are using smartphones. Is there anything so wrong in parents driving their kids to school? Maybe you and terry like your kids to walk for miles to school, thats your choice but please lah, dont make it like you are more saintly than the rest of us mere mortals. Terry as an example…on one hand, all talk about eco this eco that but travels around the world in a Plane? Maybe terry or yourswlf have an eco plane or maybe you guys walked around the world? One thing you are right..Singapore is mostly fake…buildings, roads, shopping malls, your home are all man made and fake. So is the great wall of china, the pyramids, lighthouse of alexandriq, bukit brown, hanginh gardens of babylon, your hdb, marina bay sands, machu picchu, stonehenge, ta prohm, luxor temple, ion orchard, MRT. So what are you talking about? What is not fake? You want to be natural, just throw away your phone, your snazzy gaget, your internet, your house, your underwear, your clothes , your shower gel. Also please name 1 country that is not economic driven? Burma is not meh? Denmark is not? Sweden is not? Dont want to pay mortgage? Live in a tent…but hey, you need money to buy a tent..even a tent is fake. Point is….more education on environmental issues a Big YES! A lecture on self rightous and a holier than the masses attitude, no. Gerald, I love your interest in the environment and your entertaining comments but this one doesn’t make much sense. I think you missed the point: I don’t claim to be an ecologically sustainable writer (although I try my best) whereas Gardens By The Bay calls itself an eco-park, which couldn’t be further from the truth. I don’t know why you talk of fake things or Burma and Sweden. We are talking about Gardens By The Bay. I don’t have time to read any more extensive comments but I wish you well, and good luck in your pursuit to go organic – you’ll love it, so will the earth. You’re absolutely right, Jedi One! It IS only my opinion – so is everything that I write. All the people who want to have me beheaded for disliking Gardens By The Bay can start their own blog – I didn’t answer the 1000 comments about this post but there are some very cranky people in Singapore. Some very smart people too. I think the air-heads who designed and built this monstrosity didn’t quite catch the meaning of ‘eco’. As I have always stated to friends, they cut down an entire pristine forest to build a fake one. Mind. Blown. And in the process, thousands or millions of organisms died as their home was destroyed. And they call it an eco-park. Mind. Blown. Again. I will never go anywhere near this place. In total agreement. Unlike most local who will rabidly defend the govt to no limits, there are the few who see Gardens by the bay as it is…..an ecological disaster. It is a very fake and sterile example of a botanic gardens. It’s like a rich’s man’s garden, they plant whatever they want, and instead of properly caring for the plants to let them flourish naturally, they just simply spend money to constantly replace the ones who have died, due to lack of care, or inability to acclimatise. The flower garden, and cloud forest, are simply prime examples of the excesses and wastages to which this govt would go to, to glorify itself. It’s simply a demonstration of an extremely high capacity, no doubt high energy cost and huge carbon footprint example of an air-conditioner system. There’s nothing ecological of keeping a place the size of 1.5 football fields, at a constant 23-25degrees celsius, when the outside temperature even at night is mostly 28-35deg year round. And you would think that this would be a little forest utopia? nope…many of the flowers on display constantly die, and there are many brown plants and leaves all over. here are other botanic gardens around Sg that at least have some visible experiments and research in botany. This place? just a display cabinet of a rich man and his excesses, just to prove that he can do whatever he wants, as long as money is no object. I am singapore citizen… And this place was first opened, a ot of our locals thronged the place.. the hype it soon died down …Firstly it looks fake just like the other attractions in my country.. everything works like routine planned tour..everything arranged like landscaping..and its location is wrong.. its a middle of a business district.. that alone dampens the spirit of nature … i will rather go look at some totally natural surroundings created by earth but less organised and its raw state.